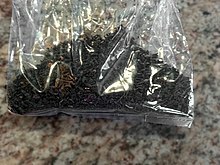 The black teas included in the blend vary, with Assam, Ceylon and Kenyan teas predominating, and Keemun sometimes included in more expensive blends. Common brands of English breakfast tea include Twinings, Dilmah, Taylors of Harrogate, Ahmad Tea, Tetley and PG Tips. Accounts of its origins vary. Drinking a blend of black teas for breakfast is indeed a longstanding British custom. The practice of referring to such a blend as "English breakfast tea" appears to have originated not in England but America, as far back as Colonial times. An additional account (referencing a period-era Journal of Commerce article) dates the blend to 1843 and a tea merchant named Richard Davies in New York City. Davies, an English immigrant, started with a base of Congou and added a bit of Pekoe and Pouchong. It sold for 50 cents a pound, and its success led to imitators, helping to popularize the name. An investigation to find this source failed to locate it but did come upon an earlier reference to the same story in an 1876 edition of the Daily Alta California, citing "a New York commercial journal" and dating the tea's origin to 1844. In an 1884 American publication it was noted that "Bohea teas (are) known to trade in this country as "English Breakfast" tea, from its forming the staple shipment to England". Accounts of the emergence of the blend in the UK give its origins in fact in Scotland in 1892, where it was initially known simply as "breakfast tea". It was in part popularised by Queen Victoria, having returned to London with a supply after tasting the tea at Balmoral and it subsequently acquired the prefix "English". ^ ZoeAnn Holmes. "English breakfast tea - Food Resource - Oregon State University". food.oregonstate.edu. Archived from the original on 2013-11-04. Retrieved 2013-03-26. ^ "History of the English Breakfast Tea". Logoi.com. Archived from the original on 2009-01-10. Retrieved 2009-03-12. ^ a b "English Breakfast Tea - Evolving Blend or Invented in NYC?". 12 March 2015. ^ "Daily Alta California 5 February 1876 — California Digital Newspaper Collection". ^ ""A cup of tea", containing a history of the tea plant from its discovery to the present time, including its botanical characteristics ... and embracing Mr. William Saunders' pamphlet on "Tea-culture - a probable American industry"". ^ "English Breakfast". Marahtea.com. Retrieved 2016-03-15. ^ "A history of breakfast". Yorkshire Tea. 2013-02-14. Retrieved 2016-03-15. ^ "What is English Breakfast Tea? What does it have to do with breakfast?". MrBreakfast.com. Retrieved 2016-03-15. ^ "A brief history of Brodie, Melrose, Drysdale & Co Ltd". Brodies1867.co.uk. Retrieved 2016-03-15.